Adventure vacations for the busy professional. Outfitters and Guides can help you have a fun and safe experience on your outdoor trip. Easily find your dream vacation. In OUTDOORTRIPS.INFO you will find professional Outfitters and Guides that offer outdoor trips in the U.S. and many parts of the world (Europe, Costa Rica, Patagonia, Chile and many more). This is more than a directory of outfitters. You can find specific trip information. After you find the trip or outfitter that interests you, you can request a brochure or click-through to the outfitter's web site to find out more information and cost of the trip you have been looking for. 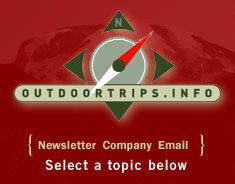 Professional Outfitters and Guides can help you have a fun and safe experience on your outdoor trip. All types of outdoor activities are available for your next outdoor adventure. From soft adventures to world class extreme adventures you can find it here in OUTDOORTRIPS.INFO.